Weli Oya Police today arrested 18 suspects including three women in connection with assaulting the police officers and aiding to flee a suspect who was held in custody by the police. Police said that Weli Oya police Station had arrested a person with cannabis in possession on Saturday following a tip-off on Saturday. However, the suspects including some of the relatives of the arrested person had obstructed the police officers in Janakapura area to carry out their duties and they had assisted the suspect to escape the scene. The Police vehicle was also damaged. A Sub Inspector and five Constables who received injuries by the incident had been admitted to Sampath Nuwara Hospital and they are receiving treatments in house. 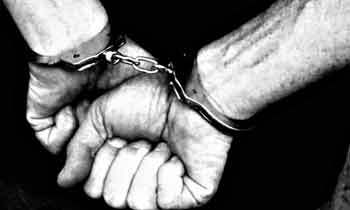 Police said that following the instruction of the Mullaitivu ASP a police team had conducted a special raid in the area and arrested the suspects. Very quick action. People who robbed billions are roaming free. Will the suspects be admitted to hospital? Something smells fishy. So many civilians do not rise up to protect a criminal.